Jim here in Montreal Canada. 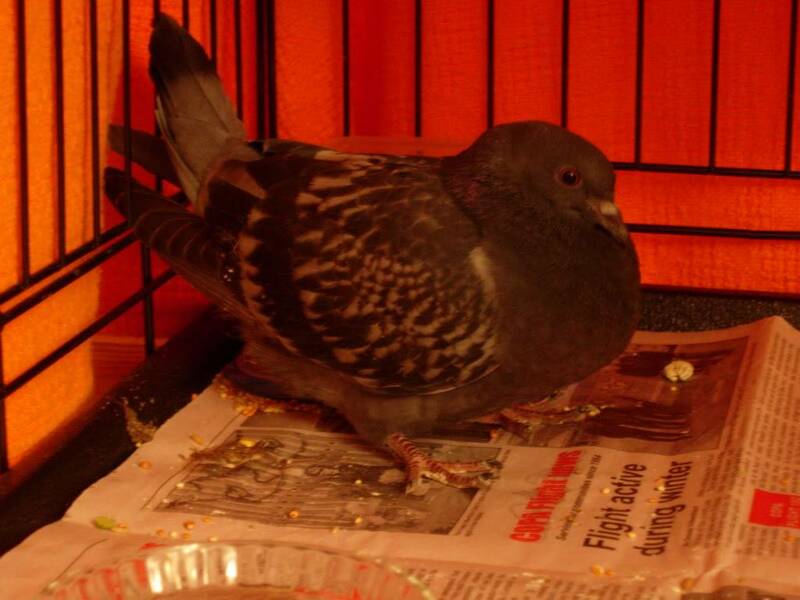 I brought an injured Pigeon home from work a couple weeks ago. It seems he flew in to the large plate glass window in front of our building. For 9 days he was happy in an improvised hostel(dog kennel). He ate and drank with great enthusiasm. On day 9 he started trying to get out of the cage. My wife thought he was going to hurt himself so she released him on the balcony and he flew off. The next day he was back and now sleeps on our balcony. The door was open today and I think he would have walked in if we allowed it. The temps are heading for subzero soon and I don't know what to do. I don't want to put this wild animal in a cage but I don't want him freezing to death in a weakened condition. I live only about a mile from work where I do see pigeons. If my wife agrees I'd like to keep him as a pet he is so neat to watch. Can he survive on my balcony. He looks great just not motivated to get back with his clan............Thoughts????? OK Montreal has had super high winds the last three days and Brian has not moved off our balcony. He looked so cold and miserable my wife went out to get him. Funny thing happened he jumped off the window ledge and ran in our apartment through the open door. We dropped a towel on him and put him back in his kennel he is now laying on the floor of his cage and pecking seeds in close proximity but mostly looks totally relaxed like holy cow I'm happy to be in here. Also poking his little beck in his water and splashing it around a bit. OH a Question what do you guys think of me putting a mirror up for Brian I put a little one in his kennel last week and he knocked it over seemed annoyed! Hi Jim, Welcome to Pigeon Angels! Well, it seems your little feathered friend has just given you the answer to the he/she question -- attacking the mirror (because they think it's a rival male) is typical male behaviour! So Brian sounds good,very unlikely he'll turn out to be a Bryony! You can leave the mirror in there with him, but he'll be likely to attack it now and again, and do a lot of aggressive posturing in between! He looks 4 weeks old in that photo, and at that age they can become attached to their carers. He's obviously come to see you and your wife as family members! However, especially after puberty, he will also want to fly and meet lady pigeons. For the time being I think it's a great idea to keep him in, as he is still pretty young and the early onset of a harsh winter could cost him his life. But when Spring comes, you will have a choice between keeping him indoors and perhaps getting him a companion, or letting him fly free and come in and out as he will -- because he will, at least for a good while! I've got a few regular visitors that come in the moment I open my window, have the meal I lay out for them where they've always been accustomed to eat, then go off again. Most will do that for a couple of years and then start spacing out their visits as they acquire new territories and become fully independent. Males come back more frequently than females, as these usually move into their mates' nesting territory. 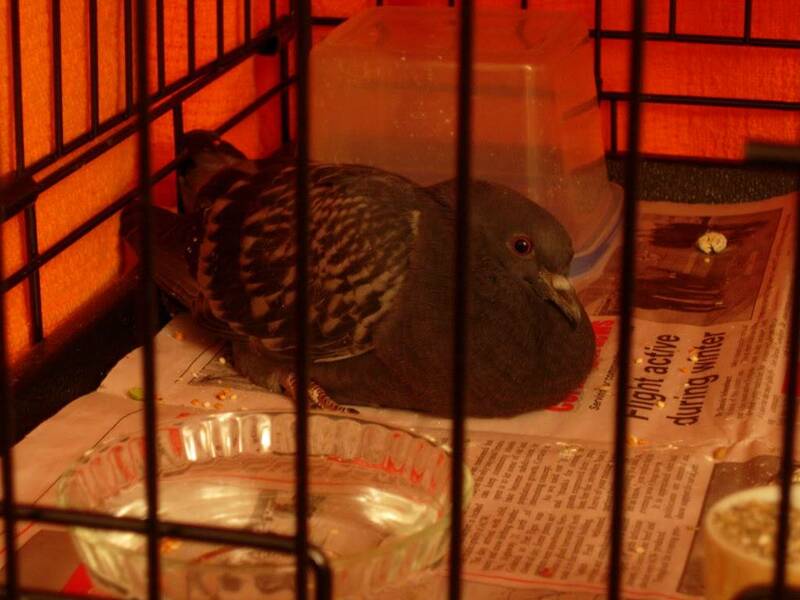 Pigeons make great pets! All so different, with such individual personalities! I remember when I thought 'a pigeon's a pigeon, seen one seen them all' but of course it's not the way it is. They never cease to surprise me with their intelligence, their memory and even their little quirks! As for the question on whether he'd survive on your balcony, he definitely could, if he could have a waterproof, draftproof shelter. 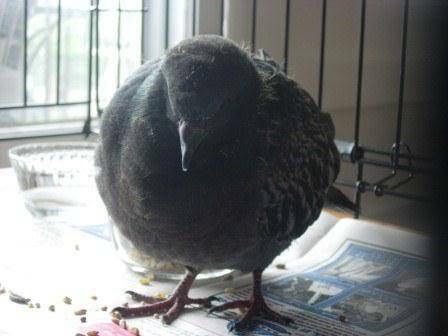 Apparently pigeons can handle low temperatures when they're healthy and have a good diet, but damp and drafts are very problematic. Thank you so he's a baby more or less must have got separated from the family when we found him. Here is a couple more snap shots. Do these still look like a baby. Not a baby any more, but a proud adolescent! In the second photo he looks like he's about to wing-slap the camera! Pigeons grow up very quickly, so much so many people have never seen a baby -- or think they haven't. Shortly after 2 babies hatch the parents mate again, and a new batch of 2 eggs can be laid nine days later. This means that a new pair of babies can hatch when their older siblings are between 3 and 4 weeks old. But by that time they will usually have learnt to fly and eat for themselves, and so the parents may push them out of the nest to fend for themselves. I think that's what happened with Brian, especially considering how capable and independent he was. But when you find younger babies, still with most of their yellow baby plumage, then those will definitely have fallen out of the nest by accident. Thank you so much for the info. It makes sense we had a long warm summer probably good for breading pairs a fall or late summer baby will definitely have challenges in this climate. I know so little about birdies just that the wee beastie was having a bad day when I found him and now he seems much better. Snow and sub zero temps are just around the corner this weekend coming. I couldnt leave him out on the balcony one more day it was killing me. My wife put an empty egg carton in his kennel he really seems to like it he has started peeping now sitting in the little carton. We may be moving in the new year to Hamilton Ontario still cold but not as brutal as Montreal maybe I can release him come spring would that so horrible keeping a wild thing over the winter. i want him to be happy but I want him to have a chance.........Its crazy how fast a little creature grabs your heart. I have a long business trip coming up in a few weeks and my wife is coming along. 8-10 weeks to long away. I'm going to need help from a familiy member to watch Brian for awhile! PS My wife decided to provide Brian with suitable newspaper lining for his cage ... the Flight News section of the Canadian Owners & Pilots Assoc. ... specifically an article on a Flight staying active in the winter! Great profile pic! I'm starting to think that pigeons attract people who can fly... We have another flier here in the forum, and he goes by the username 'AviatorRodent'. No, it's not a bad thing at all to keep a free creature indoors for the winter, especially when it is to ensure their safety! Besides, who could resist a customised egg carton? I can't stop grinning imagining that scene, we're gonna need a photo! Its a beautiful day in Montreal light winds and 15C Brian was in quite the mood today flapping his wings like a mad man and semi angry...................... he wants to fly. I could see all the pigies out today on my way home from work. Doing the happy flying routines. Brian has grown so much in the last 3 weeks with pretty much non stop feeding. He is so strong now! I let him go fly today, I had to! The feeling of keeping him caged was just as painful as watching him hunker down in the wind storm. We are going to make him a wind proof rain proof shelter so he can come and go as he pleases. This sweet birdie needs to fly but he has a safe haven if he needs it! Everybody keep a good thought for our little Brian. 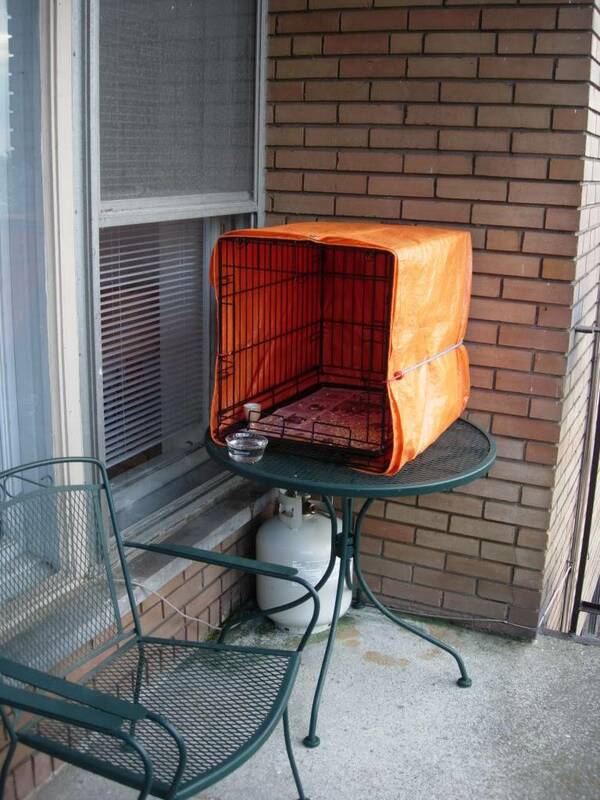 His temp shelter is ready if he comes home tonight no sign of him yet. I hope he is flying high and having fun! Hey everybody just before sunset Brian came home for dinner landed on the balcony and jumped up right into his shelter. I do have wings so I know how bad I feel when I dont get to fly. So caging Brian is hard even for his own good.......I hope he is OK. The long biz trip I was talking about was to fly for a customer. 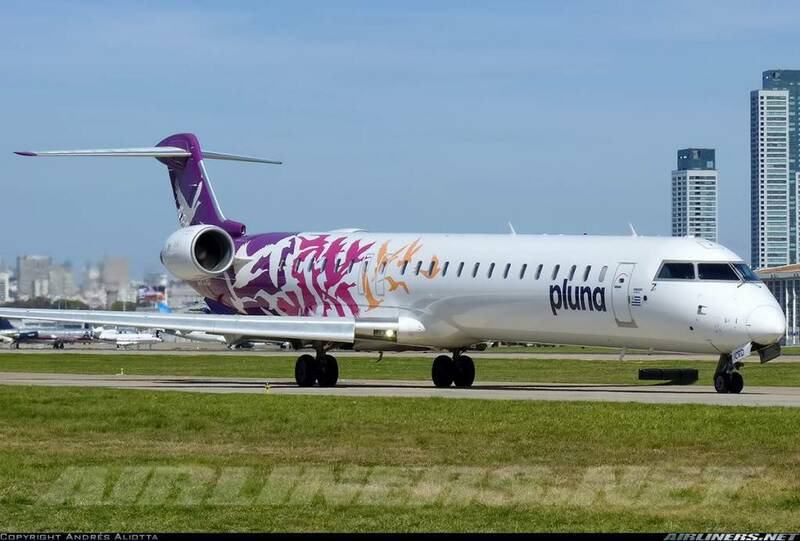 Here is a picture of one of their A/C I think they have the best paint job on any jet ever..............What do you bird lovers think??? Brian's shelter looks very cosy... no wonder he went straight in! He must be a very happy young pigeon, being able to enjoy the best of both worlds! And the plane with the flock of birds painted on it is just outstanding! Really beautiful artwork and colours! Hello all just an update on Brian! He no longer lives on our balcony. I guess this big boy found some new friends and is tucked up with them every night now that it is getting cold here in Montreal. But we still have his shelter out on the balcony and he drops by daily for some grub. He no longer hesitates to leap into the air, he now looks like a racer he is amazing. Thanks for the update, such good news! It's great to know that Brian is getting on fine! 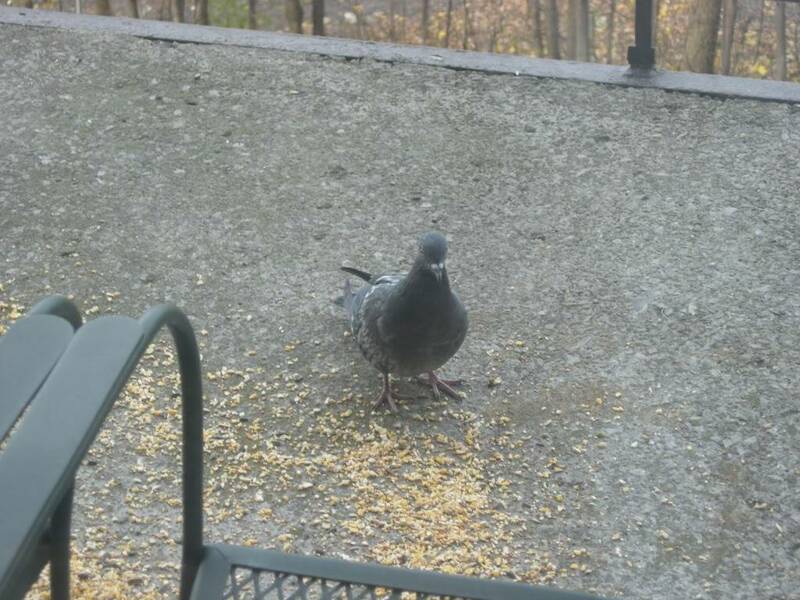 He's probably established his own territory now, but he'll keep coming round for a visit and a meal -- your own homing pigeon! It's a great feeling, seeing a youngster you helped raise become fully independent, flying like a pro, but at the same time still friendly enough to come back every day! Thank you for making sure Brian had a chance to finish growing up safely! You've got yourself a friend for life now! Thanks Teresa, Here is a snapshot we caught this morning when he dropped in for breakfast! He seems to be keeping this balcony his little secret he has not brought anyone by yet to meet us. He's looking terrific, so big and healthy-looking!